Students in South Elgin, Illinois are Excited About ACES! 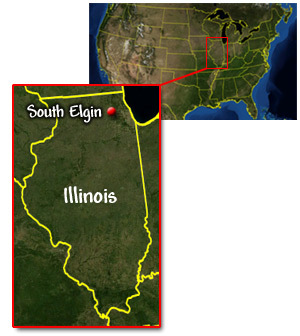 Kenyon Woods Middle School is located in South Elgin, Illinois, far from the ocean. The seventh grade students in Mrs. Kielbasa's and Mrs. Cebulski's science classes are excited to be taking part in the ACES program during the third and fourth quarter this year. Over 260 students are learning about the ocean as they never have. Most students have little knowledge of the ocean or the diversity that lives there. There were many light bulb moments during the presentations and activities. Many students quoted "I didn't know the ocean floor had so many different features," after learning about the bathymetry of the ocean. Those same students are now able to track their animals and understand how the different bathymetry affects the movements of the animals. When Billie, the loggerhead turtle, became inactive during our investigations, the students were very concerned. We discussed the reasons why she became inactive, and they concluded, "The satellite tracking device may have fallen off." They did not want to think of other fates Billie may have faced. 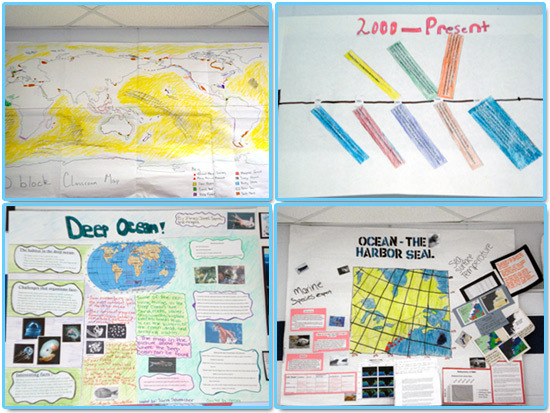 The students enjoyed filling in the world maps of the different biomes and events that happened in the ocean's history. However, when we talked about watershed and how garbage they throw out a car window can end up in the ocean, most students could not believe that this far inland would have any effect on the ocean. This has been an eye opening experience for all the students. Their final projects showed just how much the students learned and gained from this program. The ACES program is something that both Mrs. Cebulski and Mrs. Kielbasa would like to continue next year and implement more facets for the students to get a fuller understanding of ocean literacy. "We are excited about implementing the program next year and building on what we have accomplished this year," states Mrs. Kielbasa.